Here we go again. Another episode of Sherman's random Whalley adventures. Alright, I know, that doesn't sound all that promising and in fact, it sounds a bit dodgy. But rest assured, everything was on the up and up. And honestly, Whalley gets a bad rap all the time. If you've been here recently, it is really not all that bad. 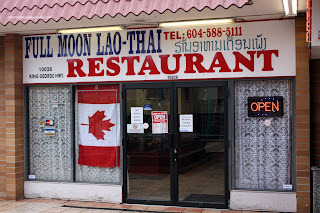 So, cruising up King George, I barely spotted a Thai restaurant hidden deep in a strip mall. It's so hidden, you cannot see it from the street. I had to park and walk-in to see if it was open. Yah, it was open alright. No customers around, but hey, I'll try anything. In fact, I was the only customer throughout my lunch t here. sauc y. Honestly, I wasn't a big fan of this dish. Although there was a good amount of perfectly cooked shrimp, the abundance of sweet, tomatoey sauce didn't do it for me. 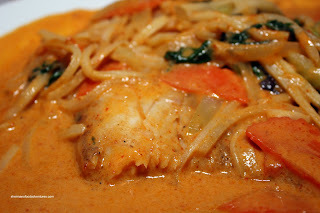 I also got the Red Curry with Basa. Hidden beneath the bamboo shoots, celery, carrots, peppers and onion lay an entire basa fillet. I was quite pleased at this discovery since that allows the fish to retain more moisture. If it were cut up into little bits, it would overcook much more easily. And the fillet was perfectly cooked with moist tender flakes bathed in a spicy (I asked for medium) coconut curry. I thought it was quite smooth with a definite kick at the end. This dish was good and plenty big too. No way I could finish it. So essentially, I had one good dish and one not-so-good. I know being the only customer would result in attentive service; but I really thought the one waitress there was actually interested in providing good service. Considering the location, I possibly might give it another go since the prices are alright and the portions are big. But, agreed, that pad thai looks scary. Doesn't that remind you of the "problem" you had with the amount of sauce you had in Amorosa? I wonder if there is a trend here, hehehehe. 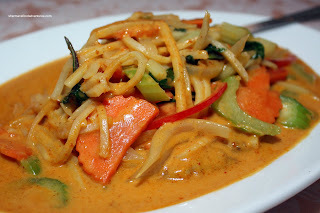 I don't like tomato-ey pad thai either, maybe try their pad see iw? Yah, the Pad Thai was not so good. Need to try something else. Anyone want to join me? no windows? makes you wonder what else is going on in there! 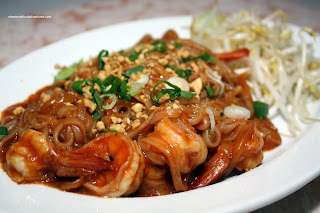 :P i like saucy noodle dishes but not pad thai like that. i like the amount of shrimp though, some places really cheap out. Trisha, the shrimp were indeed good. It really was too bad that they decided to lay on the sauce. I guess we can't have it all can we? hi, have you tried sabai thai across from guildford mall? its a small place but i think its the best! Thanks for the tip Grace! Will do! Dude, if someone, anyone, is talking about a Thai restaurant and utters the words "Want to join me? ", the answer is ALWAYS, of course!!! Actually, the correct answer is "When?"